Wireless networks have been struggling the most to cope with the exponentially increasing demand for higher data throughput fueled by the massive popularity of smart phones and tablets. Given that we are already squeezing out the maximum amount of bitssHz predicted by Shannon's limits on the wireless channel, in this project, we aim to investigate novel methods for temporal spectrum re-use through data caching to meet the soaring wireless data traffic. Our key idea is to use Index Coding to broadcast data to the caches of many smart devices, even before the data is requested. 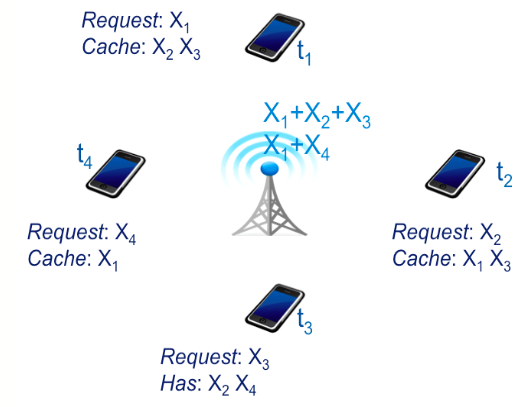 Data caching has been extensively studied in the wire-line networks. However, those approaches miss the opportunities exclusive to wireless including the inherent broadcast nature of the wireless channel and the availability of unused spectrum windows. This project aims at (1) designing algorithms for data caching on smart devices that benefit from these opportunities, and (2) building a proof-of-concept wireless system for implementing and testing index codes. Our preliminary simulation results based on idealized channel models indicate that index coding can achieve more than 40% savings in the base station downlink data. Even a small reduction of the total traffic volume by 1% can lead to savings in the order of tens of millions of dollars given the $35 billion expected investment per year in wireless infrastructure in the US through 2017. Meanwhile, we are implementing a centralized video-streaming framework, in which the server encodes the transmitted videos by index coding to enable fast streaming at the numerous android-phone-based clients concurrently.